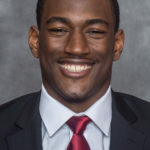 Iowa State All-American Hakeem Butler, who recorded the finest individual season by a Cyclone wide receiver in school history this fall, announced he will enter his name for the 2019 NFL Draft and forgo his final season of eligibility at Iowa State. Butler announced his decision on Twitter. The Baltimore, Maryland., native was a big-play machine in 2018, obliterating ISU’s single-season receiving mark (1,318) and ranking third nationally in yards per catch (22.0), setting another school mark along the way. Butler, who ranked ninth nationally in receiving yards per game (101.4), tied the school record for 100-yard receiving games in a season, reaching the century mark six times during the year.